It’s been fascinating watching Chip Zdarsky evolve as a writer. While I once thought of him primarily as a humorist, over the last few years it’s become apparent that his greatest strength is actually his ability to find the humanity in any character he touches, even villains. Throughout his run on Peter Parker: The Spectacular Spider-Man Zdarsky’s turned that into a strength of Peter’s as well, having him “defeat” several of his opponents (J. Jonah Jameson, The Tinkerer) by connecting and empathizing with them, by appealing to their shared humanity. Issue 308 pulls off the same feat with a particularly tricky character to humanize: The Sandman. I say “particularly tricky” because I tend to think of Sandman as a rather one-dimensional character, defined more by his cool abilities than his personality or motives, and often used as a henchman, goon, or a cog in a supervillain group. 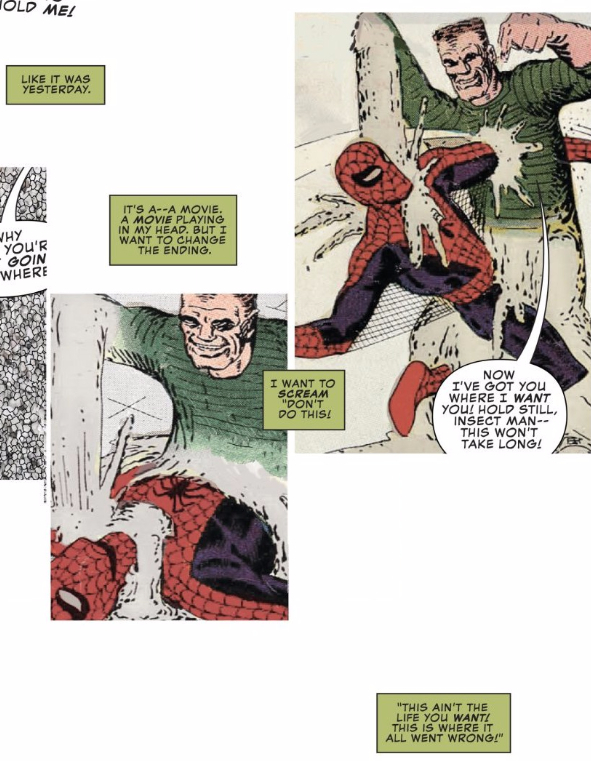 Zdarsky acknowledges that by opening the issue with repurposed Stan Lee/Steve Ditko panels that highlight the superficiality of Sandman’s past characterization, but then uses Marko’s internal monologue to assert that there’s more to the character than the stereotypical villain we’ve seen in the past. Artist Chris Bachalo then follows suit, presenting readers with a more complex Flint Marko, one whose pain, fear, and stress is evident on his face. 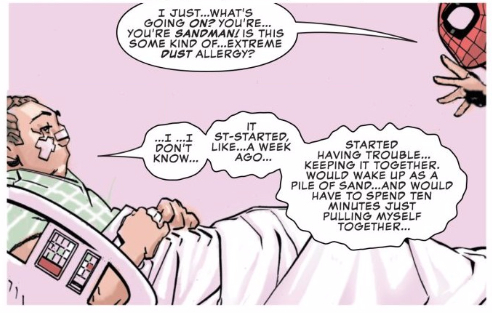 It’s easy to sympathize with this take on Sandman, to see him as a human being rather than a caricature. Peter Parker clearly feels the same, consistently refuting Jameson’s claims that Marko’s a monster with evidence supporting his moral complexity. 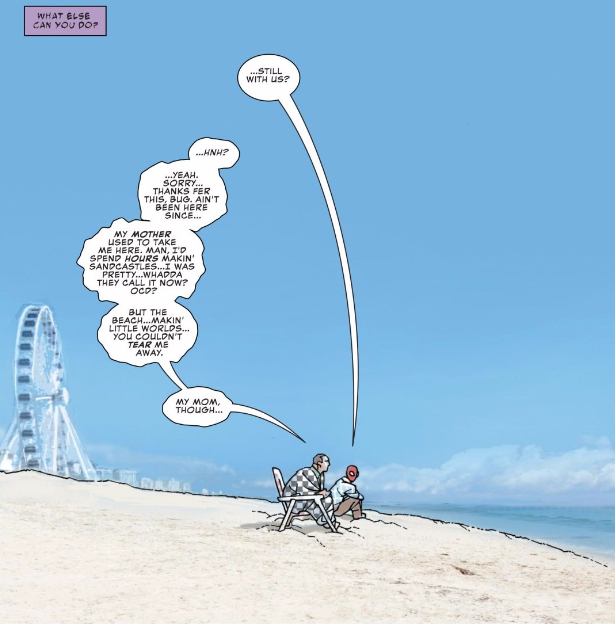 As soon as Spider-Man appears Bachalo gets to work building a subconscious connection in readers’ minds between the two characters through small details, such as the similarities in Peter’s webs and Marko’s sand splatters, which both men have been leaving all over the city (and issue). Peter’s in-person connection with Marko begins a bit more tenuously, with Bachalo leaving quite a bit of space between the two men as they first feel each other out. Eventually, though, Peter hears Marko out, understands the pain he’s feeling, and stops trying to fix things, honoring Marko’s requests and helping him face the end of his life with dignity and peace. It brings them closer together, figuratively but also quite literally, as Bachalo again highlights. It’s possible that Peter prevented what could have been a violent showdown, but his true victory is treating a dying man — even if he was a supervillain — with kindness, respect, and understanding. Reaching out and making connections is quickly becoming one of Spider-Man’s most effective abilities, and I love the message that sends. Holy crap does Spider-Man want to reveal his secret identity to anyone who is crying right now! Jameson, Sandman, the girl who dropped her ice cream cone… Keep your mask on, kid! I actually haven’t loved this run a whole lot. I was one of the few that did not like the Jameson / Spider-Man interview scene with the ending of Peter revealing his identity. I really did not get invested in any of the time travel. I think I like the sister story, except it changes such a fundamental part of Peter Parker’s identity so I’m curious as to how it will come in to play after she’s done being arrested. But I really, really liked this story. I’m pretty sure I have NO idea what’s happening next issue – the clues were pretty vague. I look forward to it though. And I have to admit that I completely loved this cover.